My big project for the week is rearranging my shade garden to accommodate an Empress Wu hosta that my mother-in-law kindly bought for me over the weekend. Empress Wu gets to be 5′ wide and 4′ tall, so some (i.e. a lot of) moving of plants here and there is definitely in order. In planning the new layout, I’m trying to come up with a pleasant design in terms of the plants’ varying heights, textures and colors. … but of course, if one is a gardener, exercise of the imagination tends to lead to exercise of the entire body. Mrs. C.W. Earle forgot to mention that part. After all that digging I’ve done so far, boy is my body tired. Here’s a picture that I took – while taking a break from digging – of one of my favorite foliage arrangements. 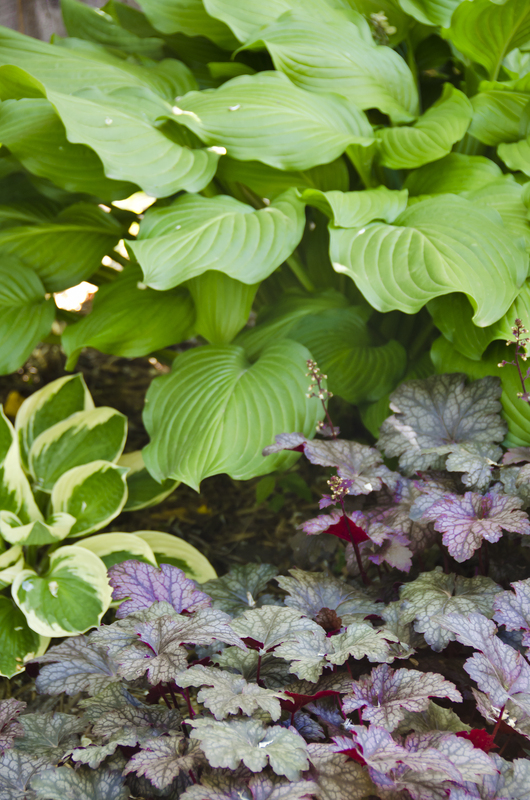 (Bottom right, heuchera Plum Pudding; bottom left, hosta Liberty; top, unknown hosta variety.) This corner of the garden I am happy with so I am going to leave it be … for now ; ) Happy gardening! This entry was posted in Gardening Images & Tips, Thought of the Day and tagged Foliage, Gardening, Heucheras, Hostas, Shade Gardens. Bookmark the permalink.